Journalists at Newsquest titles in South London have begun a 12-day strike this morning in protest at plans to axe up to 14 jobs. The NUJ members started their walkout today despite last-minute talks at the arbitration service ACAS last night aimed at averting the dispute. Union members voted unanimously to take strike action over the proposed cost-cutting drive which will see many senior roles cut and 16 weeklies placed under a single group managing editor. Talks were held at ACAS yesterday but although the company says progress was made the stoppage still went ahead today. Journalists taking part in the strike today. Gary Kendall, managing director for Newsquest South London, said: “While we did not reach a complete resolution and the strike will go ahead, we did make progress in a number of areas and are continuing to hold discussions with the NUJ. The union has received support from local politicians, including Green Party Members of the London Assembly, who said that the planned restructure would be “hugely damaging”. Titles affected by the walkout, due to last until 1 July, include the eight-edition South London Guardian series, the Surrey Comet, Elmbridge Comet and the Richmond & Twickenham Times – although negotiations between management and the union are still continuing. A picket line is being set up for journalists at Quadrant House in Sutton, where the South London Guardian titles are based, while other NUJ members will be handing out leaflets to highlight their concerns. 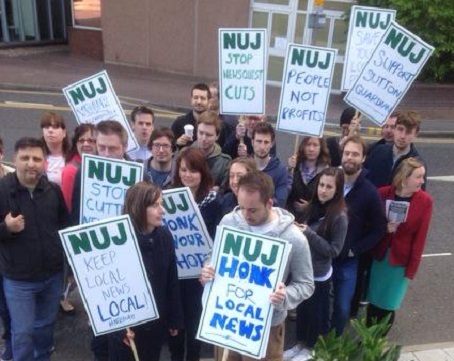 NUJ members working at the News Shopper series in South East London are also affected by the restructure and will join the strike for two days, next Monday and Tuesday. A letter from AMs Jenny Jones and Darren Johnson to Newsquest expressed “deep concern” about the restructure, which sees journalists faced with redundancy or a pay cut and 16 weeklies placed under a single group managing editor Andrew Parkes. Their letter said: “These unnecessary cost-cutting measures would be hugely damaging to the entire fabric of the local news industry in South London. Croydon Central MP Gavin Barwell has also lent his support to the strikers, saying that the cuts will undermine reporters’ ability to provide high quality journalism to the Croydon area. The union is calling for a 3pc pay rise for journalists, along with no compulsory redundancies and a workable structure that “suits the needs of the company and members of editorial”. It also wants a halt to plans to move journalists further away from the communities they serve and secure fair pay for journalists, including the London Living Wage for all reporters. Under Newsquest’s plans, up to 14 roles are at risk and, although three new posts are being created and 11 vacancies are available, many senior roles are set to disappear and staff who stay on are likely to face the prospect of a pay cut. Journalists at the News Shopper series are also set to work remotely as part of the proposals. The South London Guardian chapel said: “Our papers hold those in power to account, provide a voice to local residents and fight the rights of some of the most vulnerable people in society. “If local newspapers are not properly staffed, important stories will be go unreported and residents will be left in the dark. NUJ national organiser Laura Davison added: “Our chapels are determined to make the strongest possible case to management that they have had enough of the cuts, low pay and oppose the restructuring. Best of luck to all involved in this. What happens at the end of the 12 days if management does not relent? Shame that your local MPs don’t show the same support as the ones in Birmingham. Admirable spirit but it won’t change a thing. Didn’t in Wales, The Midlands, The North East, The North West, Scotland andThe South. Good luck but management won’t cave in. This decision has been made higher than Gary Kendall and Henry will not be changing his mind. The same has happened in other areas of London already. It seems this huge nationwide cost-cutting in every editorial department in Newsquest’s fleet has been done to subsidise the company’s purchase of Romanes. It would be nice if a forward-thinking company emerged with a clear vision and understanding that newspapers can make more money with efficient, but well-staffed editorial departments. We all seem to be getting the heave-ho in editorial yet the backward thinking, web-hating advertising departments are bursting at the seams. Why? Because most MDs are former ad managers with no understanding of how important impartial, off-diary and exclusive editorial content is to the future of newspapers online and in-print. At least it raises the issue of the dire state of the industry that has been kept from the public who buy our papers. Stick with this action and very good luck to you all. At the end of the day you are fighting not only for your own jobs but to serve the communities in your area which, like everywhere else,are being starved of vital local information. John Donovan. The strikes and associated action involving Newsquest journalists in the North-East between 2009 and the present achieved quite lot actually, namely compulsory redundancies converted to voluntary, overall numbers of redundancies cut, and one of the few pay rises in Newsquest outside executive circles. Brave move that deserves to get some results. All the best. The situation today is similar to 1978 in that we’ve had enough. Then it was appalling pay, today it is appalling treatment all round of professional people. Oh come on Alen, the strikes in the North East achieved nothing. Nor the one in West Yorkshire before it. Journalists lost money and management rubbed its collective hands in glee at the cost savings. The strike action in Darlington resulted in even deeper cuts being made because Peter Barron et al discovered they could work with fewer hands. Best of luck. Always a pity when it comes to this, but I guess it’s the only way when sheer frustration takes over. Someone has to make a stand. Wish the NUJ had the same clout as in 1978 though. Phil, you’re obviously living in a place removed from reality so you’re not worth wasting breath over. As one of the latest to suffer Newsquest redundancy all the very best of luck in your action. This slash and burn management will never learn unless chapels like yourselves keep up the fight for jobs and the integrity and viability of local newspapers. Newsquest are still making pots of money, they just need to make investment in their hard-pressed staff. Keep the faith. Make the most of those 12 days and get job hunting, take voluntary redundo and get away from this soul destroying company. When will people learn that without content we have nothing, without content we have no audience to write for and that leaves nothing to sell against………………………………..
Senior management have no control anymore, its all led by the board, NQ were a fantastic company not that many years ago, I look at the Guardian Series across London now especially and wonder what happened.